One of the most dramatic incidents in the frontier wars of southern Queensland is presented in these reconstructions and images. Pitched battles between Aborigines and Europeans were rare in any part of Australia. Battles in which Aboriginal groups won were extremely rare. Figure 2: A Bush Inn (Fassifern) of the 1850s giving a good idea of the appearance of Bonifant’s Inn. According to both James Porter (who knew the participants) and the Sydney Morning Herald, the battle grew from the quandary of Lockyer, Upper Brisbane and Downs settlers over what to do after being evicted or severely attacked in their runs across the Lockyer region, Darling Downs and Upper Brisbane. 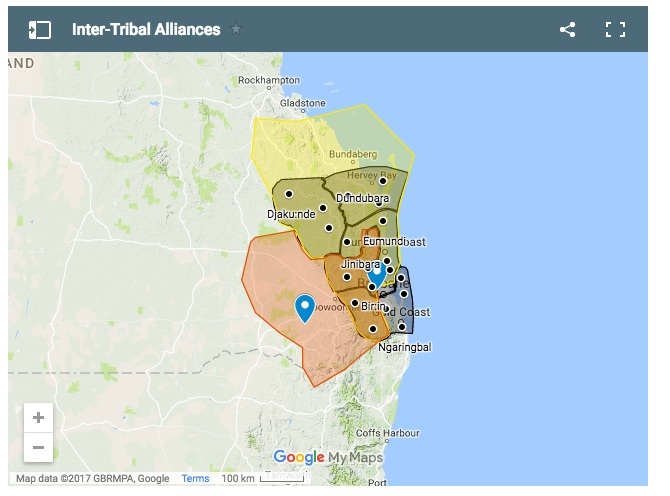 For some months, this area – some 2500 square miles – been much harassed by a “mountain tribes” alliance that was being led by Multuggerah, a leader from the Gatton and Upper Brisbane area. In particular, all the Lockyer runs (some 1000 square miles) were being held in daily siege at this time. Between 14 and 16 squatters and leaseholders met at Bonifant’s Inn (on the west of what is now Gatton) to plan their course of action. 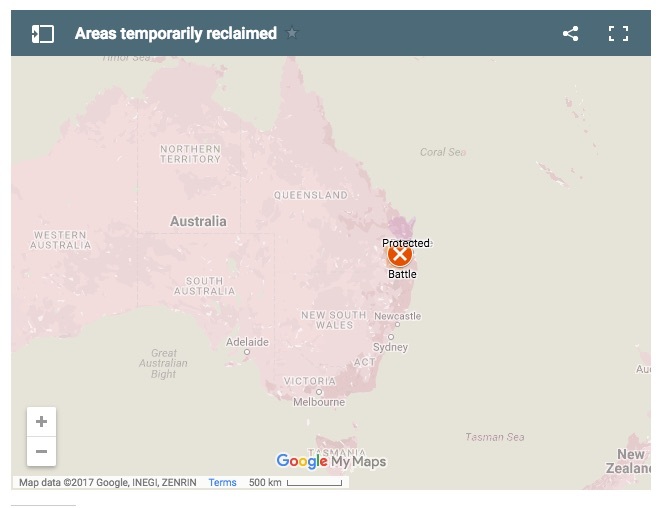 They decided to draft and send a message through their local Justice (Mr Ferriter) to Dr Stephen Simpson (the Lands Commissioner) in Brisbane, requesting police assistance. As well, they organised for a “cavalcade” to be sent up from Mr Forbes in Ipswich. This consisted of 3 loaded bullock drays, with somewhere between 6 and 36 bullocks. It was accompanied by 14 armed men (mostly the settlers’ employees), and another 4 station workers and men looking for work. The track taken by the convoy was the one most subject to Aboriginal raids and attacks. It had been constructed with considerable difficulty by the settlers of the Downs and Lockyer about two years earlier. For this reason, and as it enabled commerce and communication between the Downs and Brisbane, the settlers were anxious to keep it “open.” They believed they could accomplish this by increasing the number of drays, the number of assistants, and the amount of arms. To the settlers’ surprise, Multuggerah’s men ambushed this large and well-armed ‘train.’ The warriors had placed logs across the road to prevent the drays reversing, and additionally fenced up sides of the road with saplings tied to the trees, and created barricades. The convoy had to halt on account of all these obstacles. Whilst the dray workers were busy dismantling the obstacles at the narrowest point on the route, over 100 warriors jumped up from the creek bed they were hiding in (just beside the road). With a shout and a flurry of spears, they sent all 18 Europeans fleeing back to the inn (34 kms away). The dray was sacked of all useful goods and the warriors held a corroboree in celebration, feasting on some of the bullocks at a camp nearby. The fleeing men took several hours to reach Bonifant’s Inn. Shocked by the ambush and embarrassed at the cowardice of their men, the settlers organised a punitive expedition. All those present at the Inn and their servants seem to have been involved – some 35 to 50 men, representing many of the runs of the Lockyer, Downs and Upper Brisbane. It was nightfall of 12th September 1843 by the time they arrived near the sacked dray. They camped some 2 kilometres from Mt Tabletop (probably junction of Blanchview and Spa Water Road). Very early the next morning, the punitive party sought out the warriors’ camp, and surprised them whilst they were eating. They rode in and had their first battle. Quite a number of Aboriginals were apparently wounded or killed, but the settlers were hampered by being bogged in the mud, and one participant was wounded in the buttocks with a spear thrown by a woman. The majority of remaining warriors conducted a mock retreat up the rocky, steep slopes of Mt Tabletop (One Tree Hill). Apparently boulders had been stockpiled here in preparation. From this vantage point they were able to hurl spears, stones and even roll boulders. Many of the squatters’ muskets were shattered. Several of the squatter’s group were badly wounded by the stones and boulders, but no squatter was killed. However, the 35-50 settlers were defeated. They retreated, sacking the warriors’ empty camp on their way out. They camped out near the sacked dray and waited for Dr Simpson’s border police, but when he arrived, he found the roads barricaded again. He decided that his “small force” (six men) was insufficient for the task. This defeat was a continual embarrassment for those settlers involved. They were becoming important political figures and were not accustomed to being beaten – especially when they acted in a group. According to both local and Aboriginal accounts, the hill continued to be used as a place from which to conduct raids or roll boulders on drays camped below. The full maps in this section demonstrate the unusually large-scale settler response to the Battle of One Tree Hill. This was a campaign of chasing Multuggerah’s warriors out of Helidon and into Rosewood Scrub, with sniping and raids by both sides, en route and after. Immediately following the battle of One Tree Hill, Dr Simpson returned to Ipswich and Brisbane to gather forces. He obtained two lands commissioners, three other officers, a dozen soldiers and “a force of locals,” to which he added his six mounted police. This was probably a total of 35-45 men. 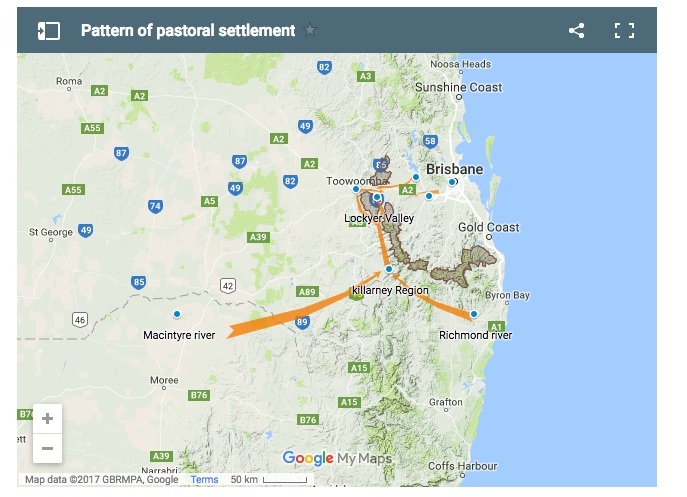 Meanwhile, the 16 station owners and/ or overseers from the Inn, representing many of runs on the Darling Downs, Lockyer and Upper Brisbane, returned over a back road (Flagstone Creek Road) to their respective homes and sent form messages to gather their own forces all over the district. Some came from as far as Cressbrook. They included station heads, servants, workers and three bush constables. This was perhaps another 40 to 60 men. Thus in total some 75 to 100 settlers including most of Moreton Bay’s soldiers and police, chased Multuggerah’s warriors from the pass. Figure 7: Sketch of the Chase – possibly the storming of Rosewood Scrub. It is recorded that one of these parties camped at Helidon. Multuggerah’s group was forced 50 kilometres along the creek and river valleys and ridges, availing themselves of broken and densely wooded areas to evade their pursuers. 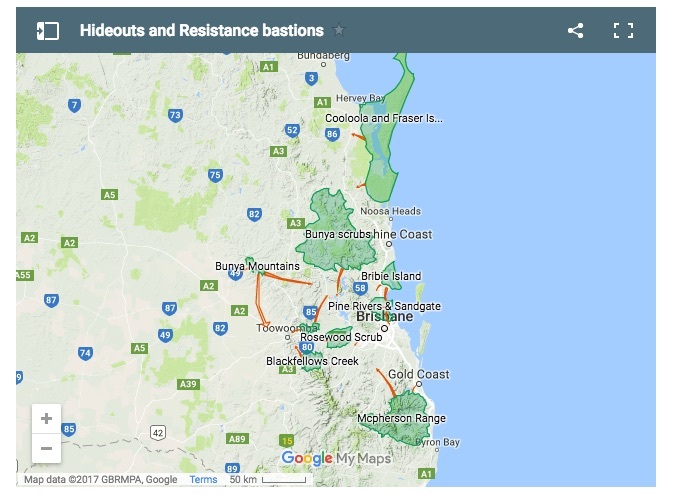 They headed for Rosewood Scrub – a 159 square miles of vine forest that once existed around Laidley, Plainlands, Lowood and Rosewood. For the entire distance, they were sniped at by the European forces, but they had the advantage of rough terrain and their superior knowledge of the district, which impelled their pursuers to follow on foot. For the next couple of weeks, Multuggerah’s warriors successfully hid in the Rosewood Scrub, where their assailants failed to locate them. They also continued raids on the settlers. The most daring of these involved some 60 to 80 warriors attacking a head station near Ipswich, belonging to Mr McDougall. The huts and stores were plundered, most belongings destroyed, and the staff were driven off at spear point, being told “to be off, as it was their ground.” Eventually, using an Aboriginal tracker, the squatters located and stormed the main base camp in the scrub, killing leaders and an unknown number of others. This was in October 1843. They also destroyed large quantities of stockpiled weapons. Nevertheless, attacks and raids continued for another 5 years, with the Rosewood and Helidon Scrubs serving as the main base for activities. Campbell, J., (1936), The Early Settlement of Queensland, Brisbane: Bibliographic Society of Queensland.